Peter Schiff Warns : Prepare For The Imminent Global Economic Collapse 2017 Stock MARKET CRASH! Congratulations to UK prime minister Theresa May for poking a finger into the eyes of EU nannycrats. EU rules say members cannot negotiate trade deals until exit from the block is finalized, but you can kiss that rule goodbye. The Wall Street Journal reports British PM Theresa May Says U.K.-U.S. Trade Talks to Begin Immediately. High-level talks between the U.S. and the U.K. on strengthening trade ties will begin immediately, Downing Street said Saturday, following British Prime Minister Theresa May’s meeting with President Donald Trump in Washington on Friday. Mrs. May’s office said a team of U.S. and U.K. officials would start scoping out what can be achieved together before the U.K. exits the European Union. Turkish President Recep Tayyip Erdogan, who Mrs. May met in Ankara on Saturday, made a similar commitment to increase trade links with the U.K. The British leader has said the U.K. is reshaping its role in the world as it leaves the EU, including by renewing its relationship with both new allies and longstanding ones. But her trip to Washington and Ankara prompted criticism from some opposition lawmakers, who said she was cozying up to leaders whose values didn’t align with those in Britain. Mrs. May on Saturday declined to comment on Mr. Trump’s executive order on refugees, saying the U.S. policy on immigration is a matter for the U.S. This prompted criticism from opposition lawmakers. Jeremy Corbyn, leader of the Labour Party, said Mrs. May should have stood up for Britain by condemning Mr. Trump’s order. “It should sadden our country that she chose not to,” he said. While the U.K. is in preliminary talks on trade in more than a dozen countries, under EU law, the U.K. can’t finalize any trade deals with other countries while still a member of the bloc. The U.K. has tested the limits of that rule. 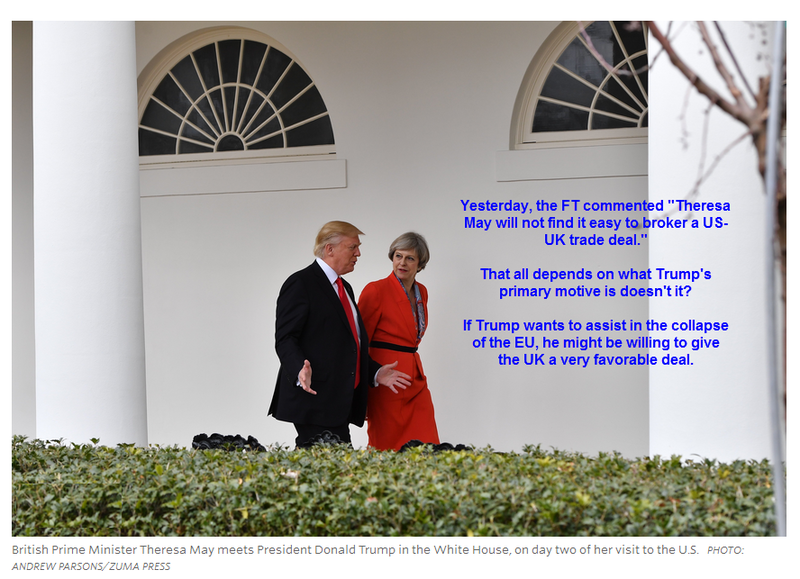 Over lunch at the White House on Friday, Mrs. May and Mr. Trump agreed to maintain the same trading relationship the U.S. currently has with the U.K. in the immediate aftermath of Brexit to ensure stability for businesses, Downing Street said. Mr. Trump has said he wants to agree as soon as possible to a trade deal with the U.K. Testing the Limits or Clear Violation? It’s hard to say why Theresa May cozied up to Erdogan (simple defiance of the EU? NATO?) , but it makes sense to start trade negotiations with the US now. Working out a deal now to be signed the moment Brexit is official seems more like a violation of rules as opposed to “testing the limits”. Regardless, what the hell can the EU do about it? Yesterday, the Financial Times reported Theresa May will not find it easy to broker a US-UK trade deal … “British agriculture and financial services may suffer at hands of Capitol Hill”. That all depends on what Trump’s primary motive is doesn’t it? If Trump wants to assist in the collapse of the EU, he might be willing to give the UK a very favorable deal. 4) a high degree of government control over the financial sector and largest borrowers (SOEs) means that debt restructuring can take place gradually with government coordination rather than in a disorderly manner forced by the market. A central bank that always stands ready also helps to shore up depositor confidence in the banking system, helping to reduce the risk of liquidity events. This is why we still think that China's credit cycle may be a more drawn out process than one that is disrupted by a typical liquidity-related debt crisis. However, while a conventional debt crisis may be avoidable, UBS admits that ever-rising debt is problematic even if problems do not manifest themselves in a crisis. The fact that debt is rising much faster than output year after year and an increasing share of debt is allocated in nonproductive or excess capacity sectors means misallocation of resources. Such systematic misallocation will depress long term productivity and economic growth, and wasted resources mean more potential bad debt will be created. While the aforementioned unique factors can allow China's credit cycle to last much longer than in other economies and with less volatility, this lack of a market-clearing mechanism could depress corporate profitability and investment, leading to lower or stagnant economic growth over a prolonged period of time. Eventually, the cost of accumulating so much bad debt will have to be borne by the financial sector and savers, asset prices will have to correct, and the ultimate cost of adjustment may be substantially larger. How will this debt cycle play out and what to watch? Risk of a more disruptive break in the credit cycle has risen in recent years. The credit cycle could be more easily disrupted if 1) banks run out of "free" liquidity and have to rely on wholesale funding to finance balance sheet expansion, which provides less reliable funding. Banks may be forced to slow credit expansion sharply in the event of a market confidence collapse or asset price plunge; and 2) Large capital outflows persist for a prolonged period, with the resultant domestic liquidity tightening increasing banks' exposure to international market conditions. Indeed China is experiencing rising capital outflows as a result of the government's earlier push for capital account opening and the more recent weakening of market confidence (Figure 13). The rapid shadow credit expansion is a risk. Shadow credit is less regulated and adds multiple layers of intermediation that increases risks and financing costs. More importantly, when multiple layers of shadow credit underpins the economy's overall funding structure, it becomes much harder for the government to quickly identify where funding problems may be or as they appear, compromising their ability to promptly oversee and manage any liquidity situation to prevent it from warping into a bigger systemic issue. As shadow credit becomes increasingly important, the government's ability to use banks to bailout the shadow banking sector will also be diminished. net capital outflows – persistent large outflows will erode China's domestic liquidity buffer. Well the final data is in and Janet Yellen’s “hot” economy is a disaster. The US finished 2016 with GDP growth of 1.6%. This is flat out embarrassing. And it confirms what we have suspected all along: that the 3Q16 numbers were completely fabricated in an excel spreadsheet for political purposes. Top Wall Street Chartered Technical Analyst (CTA), Ralph Acampora of Altaira Wealth Management returns with his outlook on US equities and the PMs. With the Dow Jones Industrials over 20,000, a new record, our guest outlines why stocks could still be undervalued by 10% and even surprise the bulls. Bill Murphy of GATA.org and the host discuss the prospects for the PMs sector in 2017. According to Bix Weir, a 1/1 gold / silver ratio is merely a matter of time as emerging technologies increasingly rely on silver. Any analysis of gold must have a correct premise. And terms used in that analysis must be clearly understood. For example… “Are you pro-gold?” Just exactly what does that mean? Is it a political or moral issue? In other words, does someone’s position on gold indicate ideology or lifestyle choice? Can a political liberal be pro-gold? And if someone answers the original question in the affirmative, does that mean they are anti-something else? As Vocativ.com reports, the call for private companies to submit plans is part of Governor Andrew Cuomo’s major infrastructure package, which he introduced in October. New York City wouldn’t be the first in the U.S. to have a network of facial recognition cameras for law enforcement. In 2013, for instance, the Los Angeles Police Department admitted it had deployed 16 cameras equipped with face recognition software, designed to search for particular suspects. We are entering into a phase in our country with a moment of decision to come with the U.S. elections. Martial law is always just around the corner, waiting to be inflicted on us. These are techniques you’ll have to incorporate into your daily routine and they’ll take some practice. Awareness and the ability to act on what is happening around you are the keys you’ll need to be able to make it all work. We’d like to hear any suggestions you have on the matter that may work for others. Keep fighting that good fight, and stay away from those cameras! A sunken British warship wrecked off the coast of South America is due to see the light of day once again -- along with L1 billion in gold coins. The Lord Clive was blasted by cannon fire in 1763 after an attempt to reclaim Uruguay's Colonia del Sacramento, a former British colony that had been seized by the Spanish. While Captain Robert McNamara planned to launch his attack and take over the city at the end of the Seven Years' War, Spanish forces were secretly planning a counterattack. ... and unlike the United States, it can't just print the world reserve currency. Greece's public debt and financing needs will prove "explosive" in decades to come unless Europe overhauls its bailout program to ease the load, the International Monetary Fund says in a draft report as the country seeks a fresh loan payout. In the IMF's baseline scenario, Greece's government debt will reach 275 percent of its gross domestic product by 2060, when its financing needs will represent 62 percent of GDP, the report obtained by Bloomberg says. The government estimates public debt around 180 percent of GDP at present. This post features the latest versions of a selection of gold market charts created by the GOLD CHARTS R US website that have been chosen so as to capture gold demand, supply and physical movement data across some of the world's major gold markets. These include charts of Shanghai Gold Exchange physical gold withdrawals, Swiss gold export and import statistics, and Russian gold reserve changes. There has been a lot of discussion on the remaining global supply of certain precious metals on the alternative media. I continue to read articles that state there are only ten years worth of silver remaining. Unfortunately, many of these figures are inaccurate. So, I thought I would provide an update based on recent USGS – United States Geological Survey data and information. As this charade continues to bear down on our economies, our communities and our lives we are left with very simple options – accept the reality of what is happening and begin moving some funds into gold and silver or ignore what is happening and be swept away by the money-junkies and their failure to do the right thing and allow the system to clean itself out through debt default of the too big to jail banks. Miners under the umbrella of the Guyana Gold and Diamond Miners Association on Friday warned that they would halt gold mining, reduce declarations, and stage a countrywide protest if President David Granger fails to meet with them within two weeks and address their concerns about heavy taxation. "The main problem we have to accept is that the government does not respect this industry at the present time," said association consultant Tony Shields, reflecting that miners' representatives met Granger only once, in December 2015. Shields charged that meeting with government ministers has turned out to be a waste of time, just photo opportunities, and the time has come for the Guyanese leader to have a big meeting with the miners rather than just the executive. Central bankers can tell the truth but only when they retire. HYDERABAD, India -- Former Reserve Bank Governor Venugopal Reddy said today the government needs to come out with a comprehensive gold policy owing to the metal's role in the economy and to start handling the precious metal in a better way. Speaking at ongoing Hyderabad Literary Festival here, Reddy also said it was the confiscated gold from smugglers that was pledged in the international market to tide over the country's balance of payments crisis in 1990. "It is time we have a positive approach to policy for gold. There must be positive comprehensive gold policy and I believe it is so important for the economy because so many people are dependent on it," he said. "Crores of rupees are traded in the market -- so many are consumers, so many are producers -- and the linkage it to financial sector is increasing. Therefore, it is time for the government to think of issuing a white paper on a positive, comprehensive policy for gold," Reddy said in his speech, which was titled "Gold -- Black, White, and Yellow." He said that in 2015-16 for the "first time" there was some positive signal from the government's side in regard to gold. According to Reddy, launching a gold scheme and making a permanent account number number (PAN) compulsory for purchases of gold jewellery worth more than Rs 2 lakh shows the seriousness of the government in making the making gold a commodity. "We also found that the gold jewellers were asked to provide PAN details of consumers who bought jewellery worth more than Rs 2 lakh so that it can be tracked. Recognition of gold as a commodity or something is important that public policy cannot ignore. These are signs of positive policy," he opined. Recalling the experiences faced in 1990 in the balance-of-payments crisis, he said the government had very little gold of its own and most of the metal put out in the international market was seized from smugglers. "The government of India had leased gold to the State Bank of India" (during the 1990 crisis). "How did the government of India come into possession of gold? Most of the gold was confiscated from smugglers. So the smuggled gold, the confiscated gold, came in handy," Reddy said. "Smugglers also helped us to get over the balance-of-payments crisis," he said in a lighter vein. He maintained that gold is the ultimate currency in the world, though domestically possessing it is part of Indian culture and for women it acts like insurance.